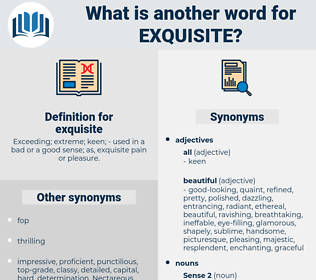 What is another word for exquisite? Exceeding; extreme; keen; - used in a bad or a good sense; as, exquisite pain or pleasure. beautiful, delicate, gorgeous, sophisticated, tasty, delicious, fine, excellent, delightful, attractive, marvellous, high-quality, amazing, awesome, charming, stunning, scrumptious, nice, meticulous, handsome, brilliant, great. lovely, magnificent, refined, sweet, superb. imprecise, disagreeable, horrible, harsh, usual, horrifying, dull, unsophisticated, inelegant, inferior, crude, indelicate, imperfect, rough, regular, unrefined, careless, flawed, ugly, inaccurate, wrong, drab, homely, second-rate, poor, ordinary, repulsive, corrupt. lesser, average, ghastly, qualified, diminished, uncultured, grotesque, substandard, coarse, mild, shallow, unacceptable, rugged, commercial, kitsch, unlovely, grim, moderated, frightful, strong, ungainly, feeble, robust, awkward, lowbrow, disgusting, moderate, vulgar, subdued, gross, shocking, eased, uncouth, toned, mass-produced, clumsy, odious, sturdy, deficient, superficial, deformed, unattractive, unpolished, horrid, wanting, popular, unpleasant, low-grade, unsatisfactory, grisly, reduced, weak, uncultivated, decreased, raffish, kitschy, hideous, alleviated, lessened. I fell asleep thinking of her, and the exquisite face still followed me in my dreams. But Lord De Vayne, full of delight, took the plant, dressed it carefully, cut it to the size of an envelope, and then with a thrill of exquisite emotion sat down to write his letter to Violet Home. 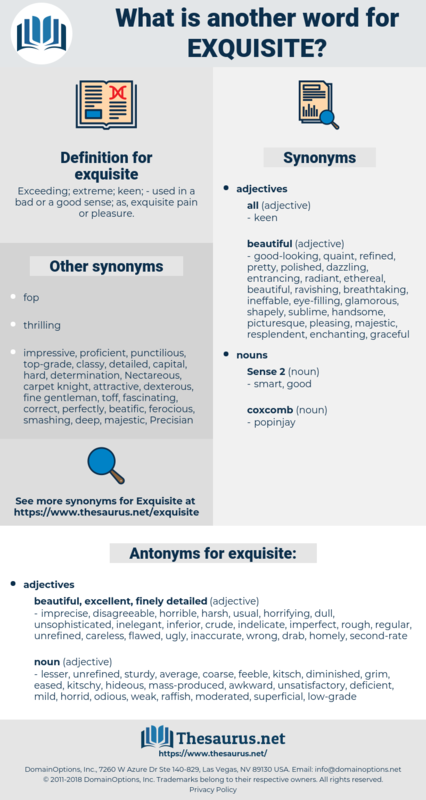 equisetatae, eight, excited, exhausted, eased, echt, escudo, each day, exode, esthete, eyeshadow, excused, eight-day, essayist, excite, equidae, exudate, eye socket, exact, eightieth, equate, egest, eke out, est, exist, eject, execute, estate, exhaust, ect, eyeshade, eighty, exhaust hood, egghead, exude, eighth, eyeshot, exocoetidae, equid, Exsiccate, exacta, egg white, egoist, eighty-two, east, executed, exiguity, esocidae, escheat, exactitude, Exegete, equity, exocet, ezed, eyesight, excogitate, exit, exceed.